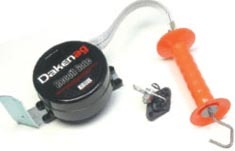 Daken Electric Fence Accessories. Cables, gate kits,connection accessories. Underground Cable. Use under gateways, links and for connection of energiser to fence. B: Standard cable. 2.5mm conductor in 25m rolls. A: Grunt cable. 2.5mm x 8.5mm heavy outside wall in 50 and 100m rolls. PT Lightning Protection. 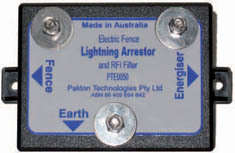 Help protect your electric fence energiser from damage caused by lightening strikes with the very effective PT Lightening Diverter! It is designed to redirect damage from the energiser when lightening strikes the fencing wire. A neat and effective alternative for electrifying gateways. 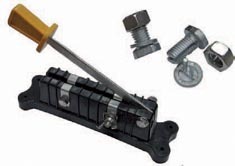 The spring loaded coil provides constant pressure when extended, then recoils neatly away. Extends to 5m and uses 40mm white tape. Connection Accessories – Switches add convenience and versatility to your system. You can apply power where you need it or turn it off for maintenance. A: Heavy duty Cut-out Switch. 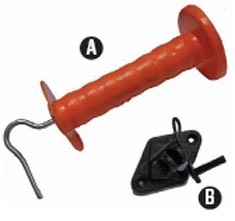 B: Line Clamp– For connecting electric fence wires and cable. Sturdy build with solid zinc construction. Takes up to 3.15mm. Strip Grazing Wheel. ‘No shock’ plastic construction, two sizes available. 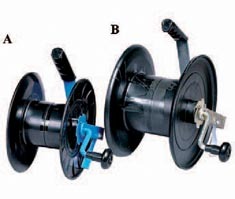 A: Plastic Reel - Holds up to 200mm of Hot Tape. B: Large Plastic Reel - Holds up to 400mm of Hot Tape. Gate Kits. All you need in one kit! 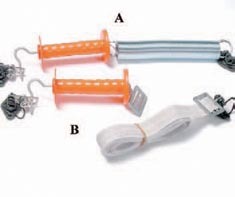 A: Sring Gate Kit - Extends to 5m. B: Tape Gate Kit - Extends to 5m. Gate Fittings. Make your own gateways!